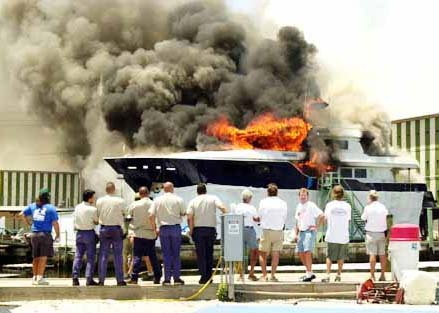 The call came in as a small fire on a boat with more smoke than flames. But when firefighters arrived at Bradford Marine off the 3000 block of State Road 84, they were confronted with a raging inferno. A 108-foot long, $6 million inferno called the Emmerson. 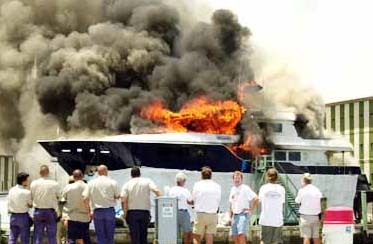 A yacht built about two years ago in a Turkish shipyard, the Emmerson was engulfed in a red ball of fire and spewing smoke. Click an image for larger, click the next for another or to close. The 15 firefighters the Davie Fire-Rescue department had deployed were not enough. 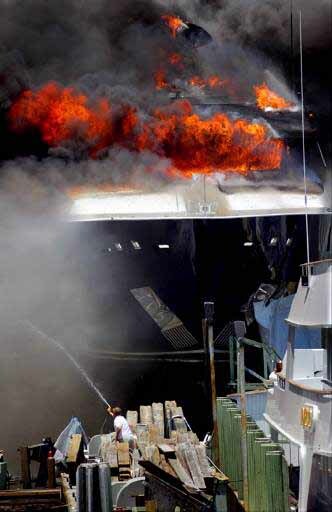 Soon there were fire trucks with more than 50 firefighters from Cooper City, Dania Beach, Broward County Fire-Rescue, Pembroke Pines and Fort Lauderdale dousing flames with U.S. Coast Guard help. 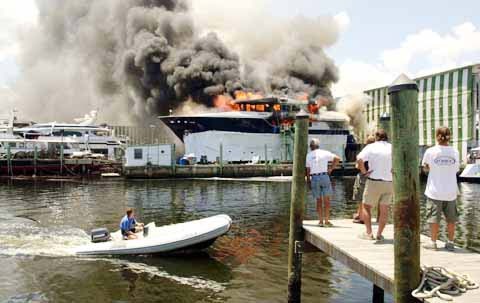 "Initially we thought it was just a small boat fire with some smoke," said Davie Battalion Chief Joe Rivero. "Then it evolved into a full-on raging fire." 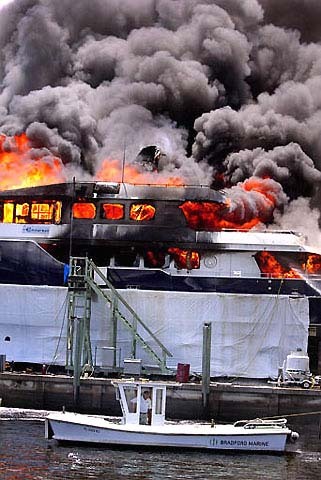 As two firefighters tried to board the boat, the heat was so intense everything around, including the air, ignited in an explosion-like phenomena called a flash over. The two men were knocked off their feet, Rivero said, but their gear protected them from burns. They were taken to Broward General Medical Center as a precaution and released in the evening. A third firefighter was treated for heat exhaustion. Rivero said initial reports suggest sparks from welders might have caused the fire.